[*]King Camp Gillette has the idea for a double-edge safety razor with a thin, disposable blade sandwiched between two plates. 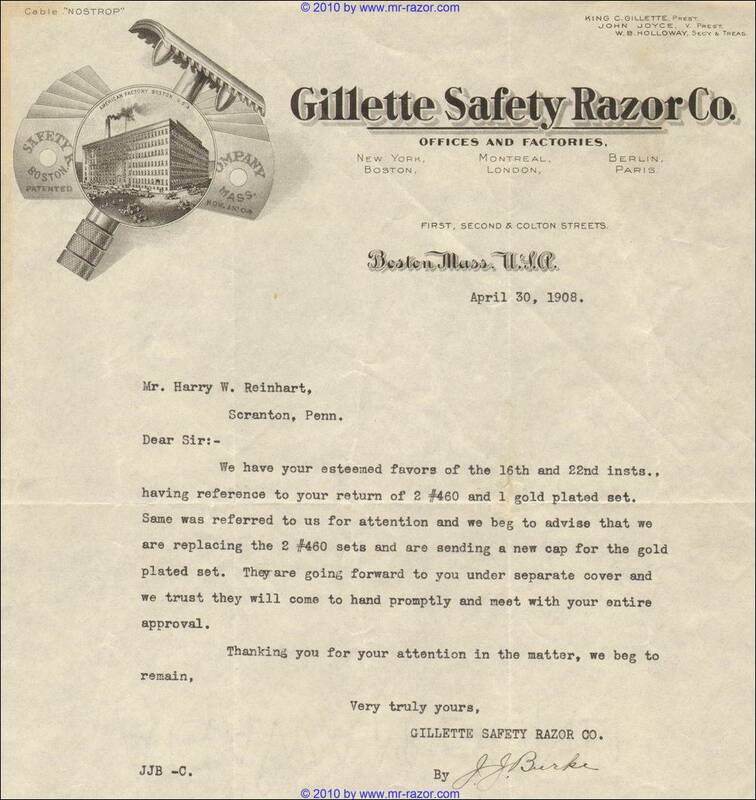 [*]King Camp Gillette applies for a patent on his design for a safety razor with disposable blades. In 1901 this patent was granted, then withdrawn in favor of a new application. [*] 28: The USA patent applied for in 1899 is granted. However the final fee is left unpaid and the patent is withdrawn in favor of a new application, which eventually became 775,134 and 775,135. [*] 28: Incorporation as "American Safety Razor Company" with King Camp Gillette as company president. The initial 50,000 shares represent $500,000 at $10 each. First offices are above a fish shop at 424 Atlantic Ave, Boston. Initial stock distribution was roughly: K.C. Gillette 17,500; Stewart 4125; Heilborn 4125; Nickerson 4125; treasury 10,000; remaining 10,000 for sale in 20 blocks of 500 shares for $250 each, or $2 per share. This raises $5,000 for the company. There are 125 shares missing from this account. The correct number for the director shares may be 4177, or possibly the director shares were not divided evenly. At this time each block for sale represents 1% of the company. No person controls more than 35% of the shares, and board holds control with 60%. Early decisions could be carried by K.C. Gillette alone, with 58% of the voting shares. [*] 3: Filing date for the patent later divided into 775,134 and 775,135, superseding the 1899-1901 patent above. [*]Company is close to bankruptcy when John J. Joyce invests $60,000. The $5,000 has been spent, along with nearly $12,000 of borrowed money. K.C. Gillette has given away all but 6000 of his shares, and attempts to sell the 10,000 shares of treasury stock fail. Joyce agrees to buy $30,000-$100,000 in $5,000 company bonds paying 8%, at 60 cents per dollar, along with an equal amount of stock. Joyce eventually invests $60,000. At the same time the company issues another 15,000 shares at $10 each, of which K.C. Gillette receives 3000 to compensate for foreign patent rights. The rest go to "others". This brings K.C. Gillette to 9000 shares, or 14% of 65,000. Joyce probably holds 6000 shares (9%) but it is not clear what happened to the other 12,000 new shares. ^Gillette, King Camp. Gillette Blade, February 1918, Vol. I, No. 4, p6. ^Patent and Trademark Review, vol. 9-11, p. 3589. ^Nickerson, William E. Gillette Blade, December 1918, Vol. II, No. 2, p9. Nickerson says 26 September, but the 28th seems to be the accepted date. ^McKibben, Gordon. Cutting Edge: Gillette's Journey to Global Leadership, p11. ^Gillette, King Camp. Gillette Blade, February 1918, Vol. I, No. 4, p9. ^The Northeastern reporter, Vol. 87, p614. ^McKibben, Gordon. Cutting Edge: Gillette's Journey to Global Leadership, p3. ^Gillette, King Camp. Gillette Blade, February 1918, Vol. I, No. 4, p10-12. ^Gillette, King Camp. Gillette Blade, March 1918, Vol. I, No. 5, pp7. ^Annual report of the Board of the State Assessors, 1902, p207. ^Nickerson, William E. Gillette Blade, December 1918, Vol. II, No. 2, p12. ^Nickerson, William E. Gillette Blade, December 1918, Vol. II, No. 2, p13. ^Nickerson, William E. Gillette Blade, January 1919, Vol. II, No. 3, p6. ^Gillette, King Camp. Gillette Blade, February 1918, Vol. I, No. 4, p10. ^Annual report of the Board of the State Assessors, 1903, p222. ^Nickerson, William E. Gillette Blade, January 1919, Vol. II, No. 3, p7. ^Nickerson, William E. Gillette Blade, January 1919, Vol. II, No. 3, pp7-8. ^Nickerson, William E. Gillette Blade, January 1919, Vol. II, No. 3, p8. ^Nickerson, William E. Gillette Blade, January 1919, Vol. II, No. 3, p9. ^Picker, Randall C. The Razors-and-Blades Myth(s). (September 13, 2010). U of Chicago Law & Economics, Olin Working Paper No. 532. ^Gillette, King Camp. 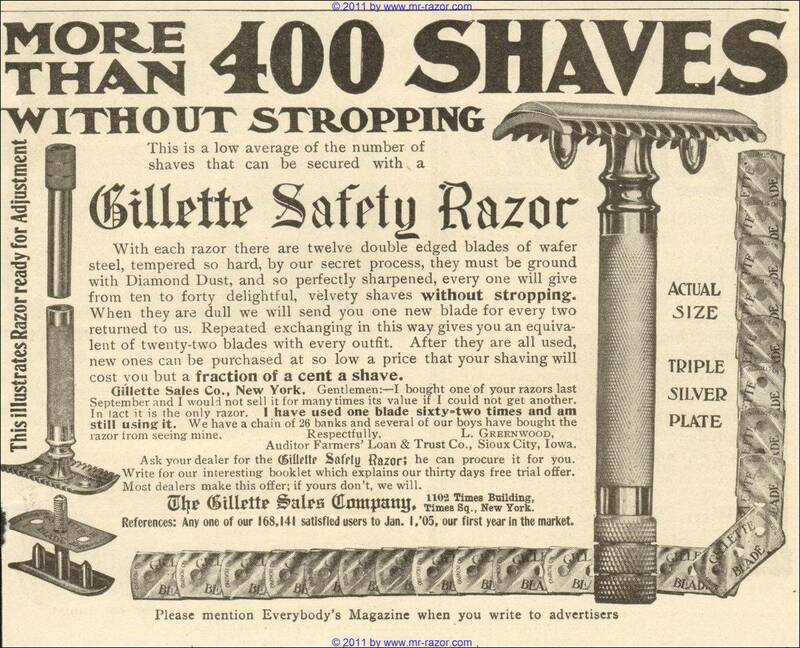 Gillette Blade, March 1918, Vol. I, No. 5, pp8-11. ^Annual report of the Board of the State Assessors, 1904, p252. ^Printers' Ink, A Journal For Advertisers, Vol. 86, No. 6, 5 Feb 1914, p78. ^Nickerson, William E. Gillette Blade, January 1919, Vol. II, No. 3, p11. ^Gillette, King Camp. Gillette Blade, March 1918, Vol. I, No. 5, p7. ^Nickerson, William E. Gillette Blade, January 1919, Vol. II, No. 3, pp11-12. ^Nickerson, William E. Gillette Blade, January 1919, Vol. II, No. 3, p12. ^Nickerson, William E. Gillette Blade, January 1919, Vol. II, No. 3, p13. ^Gillette, King Camp. 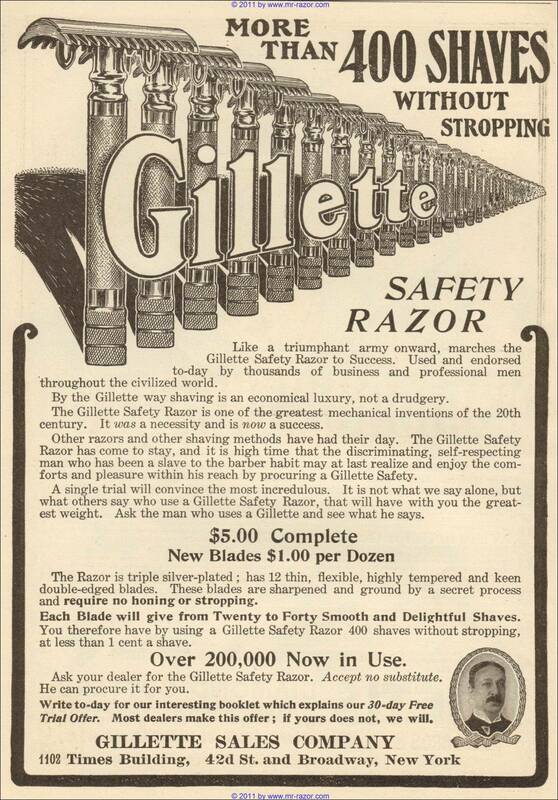 Gillette Blade, March 1918, Vol. I, No. 5, pp7-8. ^Massachusetts reports: cases argued and determined in the Supreme Judicial Court of Massachusetts, Vol. 205, p371. ^Bittues, A.A. Gillette Blade, January 1918, Vol. I, No. 3, p21. ^Adams, Russell B. Gillette, The Man and His Wonderful Shaving Device, p67. ^Gillette, King Camp. Gillette Blade, March 1918, Vol. I, No. 5, p12. ^ a b c d e fMarshall, W.E. 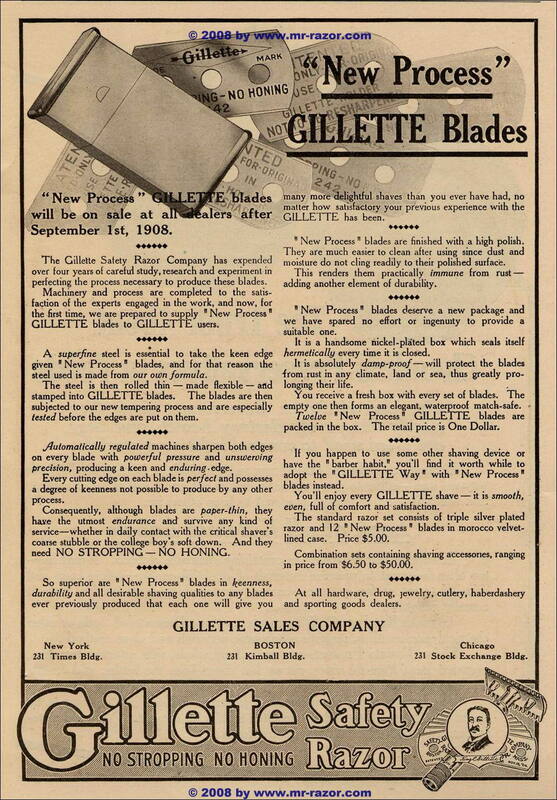 Gillette Blade, 1919, p18-20. ^Foy, Eversley. Gillette Blade Canada, July 1918, p14. ^Everybody's Magazine, May 1905. Credit: Achim. ^Unknown advertisement, dated to October 1905. Credit: Achim. ^US Congress, Nomination of Louis D. Brandeis, 1916. ^Flanagan, P.T. Gillette Blade Canadian Edition, July 1918, p6. ^Everybody's Magazine, October 1906. Credit: Achim. ^The Bankers Service Co., The Directory of directors in the city of Boston and vicinity, 3rd Ed., 1907. ^Flanagan, P.T. Gillette Blade Canadian Edition, July 1918, p6. The mention of 1906 in one picture caption appears to be a typo. ^Bittues, A.A. Gillette Blade, January 1918, Vol. I, No. 3, p22. ^Flanagan, P.T. 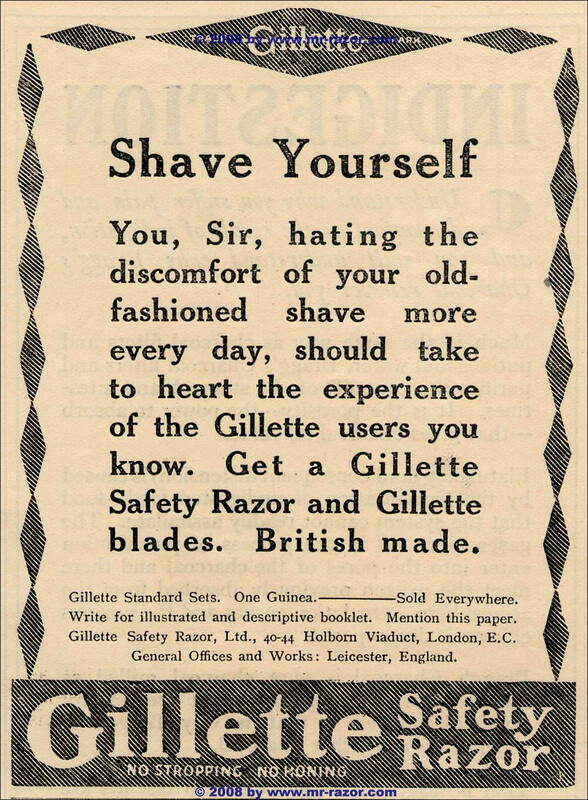 Gillette Blade Canadian Edition, July 1918, p7. ^The Bankers Service Co., The Directory of directors in the city of Boston and vicinity, 4th Ed., 1908. ^Liberal Magazine, volume 16. Dated 1909 but probably printed sometime in 1908. ^Letter to Mr. Harry W. Reinhart of Scranton PA, dated 30 April 1908. Credit: Achim. ^USA trademark registration 71034984, filed 27 May 1908. ^Monthly Notes on Tariff Reform, vol. 9, p300. ^ a b cAnalytical Digest of Cases Published in the Law Journal Reports, vol. 89, Gillette Safety Razor, Lim. v. Inland Revenue Commissioners, pp. 1194-96. 1920. 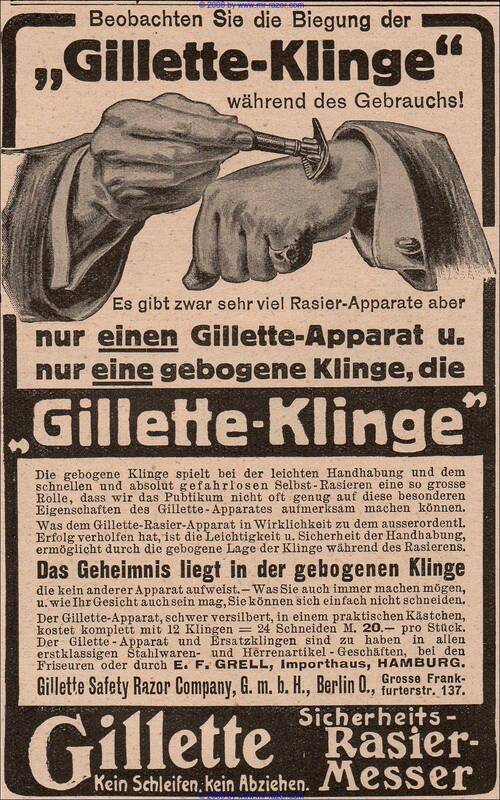 ^Advertisement for "New Process" Gillette blades, dated September 1st 1908. Credit: Achim. ^Peterson, Neil P. Gillette Blade Canadian Edition, July 1918, pp30-31. ^The American Review of Reviews, Edited by Albert Shaw. December 1908, p147. ^The Saturday Evening Post, Curtis Publishing Company. December 5, 1908, p48. ^Gillette advert. from mr-razor.com site. ^Peterson, Neil P. Gillette Blade Canadian Edition, July 1918, p31. ^Brass World and Platers' Guide, November 1911. Vol. 5, No. 11, p415. ^Gillette Blade, June 1919, Vol. II, No. 8, p13. ^American Chamber of Commerce for the Levant, Levant Trade Review, Volumes 1-4, p. xxii. November 1911. ^Gillette, King Camp. 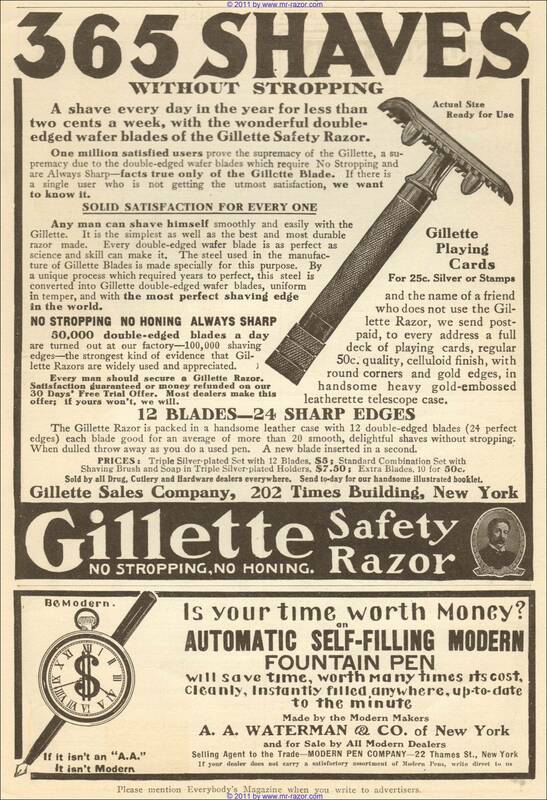 Gillette Blade, March 1918, Vol. I, No. 5, pp12-13. ^Flanagan, P.T. 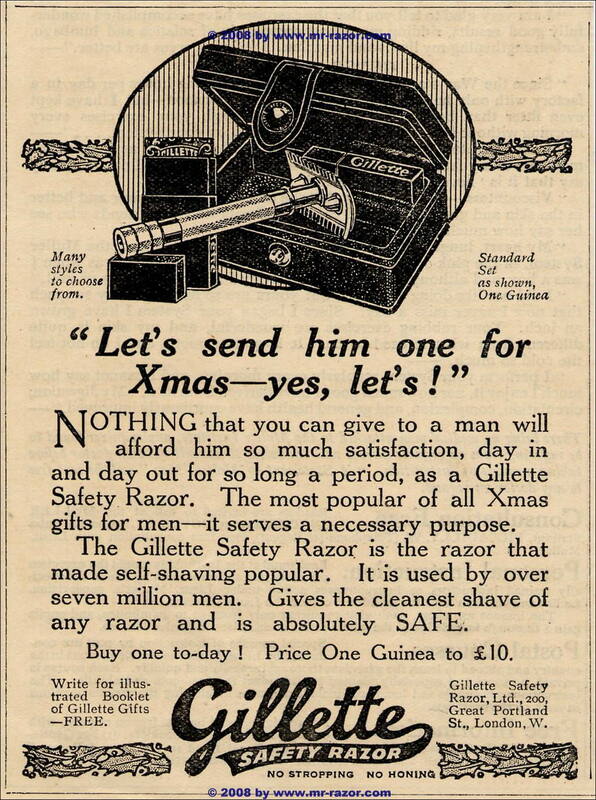 Gillette Blade Canadian Edition, July 1918, p8. The $400,000 figure seems to come from the Canadian management and may be more reliable. ^New England investments, Richardson, Hill & Co, 1919, p87. ^Moody's manual of investments, American and foreign, 8th Ed., 1917, p990. ^Poor's Manual of Industrials, Poor's Railroad Manual Co, 1916, pp512-514. ^Gillette Blade, 1918-02, Vol. I, No. 4, p14. ^Poor's Manual of Industrials, Poor's Railroad Manual Co, 1916, p513. ^See also the change in advertising from 1915 to 1916, dropping any mention of Leicester and the phrase "British Made". In 1938 Chemist and druggist: the newsweekly for pharmacy, Vol. 128, p342 (snippet view only) wrote that Leicester closed in 1912, but this probably refers to a company reorganization not the actual end of manufacturing. See also discussion at http://badgerandblade.com/vb/showthread.php/348522-Gillette-pocket-edition?p=5163593#post5163593. ^The Commercial and Financial Chronicle, Volume 110, Part 1, p773. ^Commercial and Financial Chronicle, Volume 108, Part 1, p1294. Contains complete text. ^Pacific Ports, Frank Waterhouse, September 1919, p132. ^Magistrates Cases, vol. 89, p1196 (1920, snippet view). This page has been seen 17,879 times.